It is designed with Vintage Outlook and Modern Simplicity. 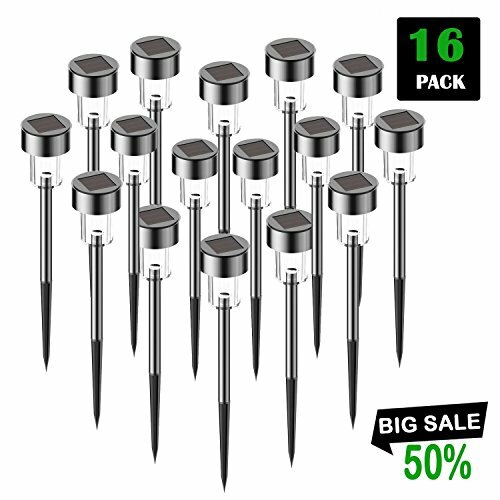 Beautify and brighten your garden/flower beds/pathways/Driveway with this set of 16 pack stainless steel LED Solar Pathway Lights! No wiring or electricity to install these solar-powered path lights.They soak up the sun's energy by day and shine brightly at night. I think it will be your best choice and there's nothing better. 1.Make sure the solar panel baths in sufficient sunlight for about 8 hours. However, it also depends on the geographical location, weather conditions and seasonal light availability. 2.First, turn on the switch under the cap, then pull out the bottom spike, install it and insert the light into the soft earth.If the soil in your garden is quite solid, we recommended that you should make a hole on the ground before inserting the spike. 3. Once you turn on the switch, the solar path lights automatically light up at night and go off at dawn! ▲Save Energy--No need any electricity.They're powered by the sun which charges using solar light in the day and power them up at night,The LED lamp charged by sunlight for 6 to 8 hours can provide 8 to 10 hours illumination,realizing energy saving. Lumens: 1.2 lumens. ▲100% Satifaction Guarantee--We know you have options here, and we want to make your best choice with a backup. That's why we offer a 100% Satisfaction Guarantee. Enjoy 12-month replacement and refund warranty if you're having issues with our product or not satisfied. If you have any questions about this product by SURSUN, contact us by completing and submitting the form below. If you are looking for a specif part number, please include it with your message.